Artist Renee Robbins is putting the finishing touches on murals at the Fullerton underpass at Lake Shore Drive. 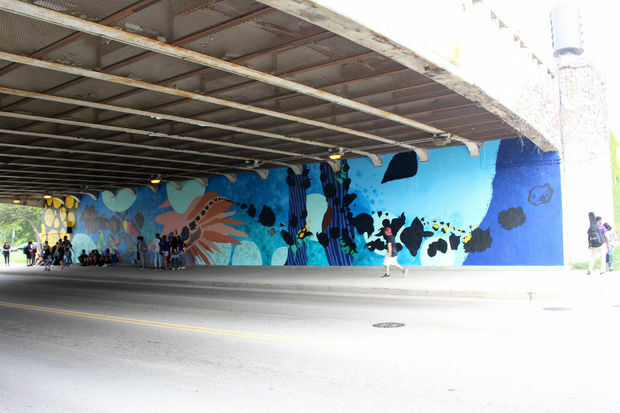 LINCOLN PARK — A pair of monumental murals are being painted on both sides of the Fullerton Parkway underpass at Lake Shore Drive. 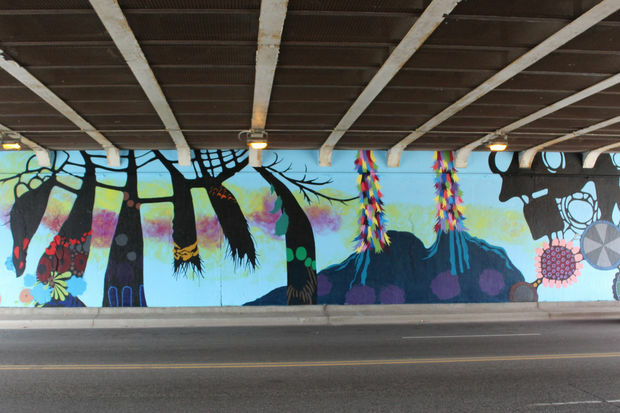 Working in conjunction with the Chicago Public Art Group, local artist Renee Robbins is executing murals across both sides of the underpass — 14 feet high by 110 feet wide. Drivers and pedestrians will notice that extensive work has already been done on the murals, which Robbins began painting in July. "We probably have about four more weeks until the murals will be finished," Robbins said Thursday. "The main shapes are there, but we will add more detail in the coming weeks." Robbins has posted video of the project on Facebook. The companion pieces are titled "A Kaleidoscope of Hidden Worlds," and the Chicago Public Art Group has attempted to explain the work by pointing out Robbins ties together humans, nature and the cosmos by fragmenting and combining images from each realm. She contrasts the real and the imagined, the microscopic and the telescopic, mixing together resonant images from space and the oceans such as stars with plankton. As pedestrians walk toward the lake through the underpass, they'll see figures on the south wall go from micro to macro. The north wall, meanwhile, delves into nearby Lake Michigan as one walks west to east, again with the small blending toward the large. According to the Chicago Public Art Group, the project has been paid for by the Fullerton Mural L3C and Lincoln Park residents. With her emphasis on the natural world, Robbins is scheduled to have a solo exhibit at the Notebaert Nature Museum next year.